Sleep tight baby boy and fly high with them angel." Scotland and Stoke midfielder Charlie Adam paid tribute on Twitter, saying: "He was a little fighter." Former England striker Stan Collymore said the football authorities should create a lasting tribute to the little boy. 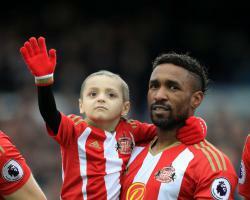 He wrote on Twitter: "Would love to think @FA and @premierleague could mark @Bradleysfight by way of a trophy or award to commemorate an incredible life."